Expansions are often a vital part of our hobby. But they are also difficult to develop. If I have previously liked the base game, so I don’t want the expansion to change the game in a way that I won’t like it anymore. Expansions to games can does multiple things; keeps us interested in older games and prolongs our will to play them by adding variety or adds another player to the player count This comes thru adding modules, new boards, decks of cards and more.Sometimes I even take into consideration if there are expansions to a game before buying it, so I know there will be more to explore once I get thru the base game. Most of the time I like expansions to do just that; add more variety, not change the game. Spiel Essen starts this week, this time we take a look at the most anticipated expansions here at Table Top Together. Keep in mind; every game expansion needs the base game to play. Imperial Settlers: Atlanteans is the first big expansion to Imperial Settlers. It first of all adds the option for playing Imperial Settlers with up to five players. The expansion includes a new faction board, technology tokens, the Atlanteans faction deck, and adds more cards for the existing factions in the base game. All together 110 new cards, tokens and player board. The Atlanteans use new technology to provide abilities on faction cards. That way it transforms common buildings into very useful allies. Another special aspect of the Atlanteans is that their faction buildings sink into the ocean at the end of the game and can therefore not score point. Because of this the Atlanteans need to use their abilities to score points. While the other factions do not have the knowledge to use the technology of the Atlanteans, some buildings for each faction allow them to use some of that technology to their advantage. The other factions do get ways to use the technology as well. Conclusion; this expansion doesn’t change the game a lot. All the factions from the base game are very different and the Atlanteans are no different. If you like Imperial Settlers, you are bound to like this expansion as well. Colt Express: Horses & Stagecoach is the new expansion to this year’s Spiel des Jahres Colt Express. Main attraction of this game is the 3D stagecoach which rides alongside the 3D train included in the base game. The stagecoach gets protection from a new guard with a gun who protects a $1000 strongbox in the stagecoach. The bandits get new horses from which they can attack the train and the stagecoach. This comes with a new ‘ride’ action. Also new are the hostages in the stagecoach which have negative game effects for the bandits throughout the game, but are also worth a ransom at the end of the game. Horses & Stagecoach introduces new round cards, two different whiskey flasks which allow you to draw cards or take two actions. A new team play variant is offered in the rules. But this variant can also be played with just the base game. The expansion is marked #1 which suggests, more expansions are coming! Conclusion; this expansion adds a lot to the base game, which might put people off because it changes the game somewhat. It’s all very thematic though and I recon players can just alternate played with or without the expansion. Abyss gets an expansion after the base game released last year at Essen. The expansion adds more variety by offering more Lords, Allies and Locations. The expansion also adds black pearls, which are like the black market currency. They can be used to obtain powerful advantages from the new Nebulises. They do come with a drawback of some sort, meaning you have to balance between using the black pearls to your advantage, but not use them too often or openly so they will punish you. The expansion also comes with an Kraken miniature, which I’m excited to see what its role is..
Takenoko: Chibis includes a miniature of the female panda, nine different tiles for the baby pandas, six plot tiles, 18 cards, and 17 bamboo pieces. Main attraction of the expansion is the new female panda. She enters the game when a plot with the Ms. Panda is places. She doesn’t eat bamboo but when placed on the same plot as the male Panda they make a cute baby panda. These are tiles nog baby figures. The baby panda tiles also allow for nice bonuses; Each panda baby token has a bonus icon on the back for either Irrigation, Improvement, or Objective Changing. That last ability is really something I was waiting for. Changing an objective really lets you migate the randomness of the card draw a bit, which is of course still present. All the new plot feature the Ms. Panda icon. The 18 new objective cards are nice to bring some more variety. Conclusion; this expansion adds the much needed Objective Changing and brings a new female Panda figure. How can you resist that! The base game can be played with any or all of the modules. The turn-order of the game is a much discussed mechanic in the base game. The new Dawn game phase fixes the turn-order in my regard. Now players bid for turn-order using battle cards! The path of the souls is a whole new board with priest figures moving towards Ta-Seti. Here the priests acquire objects or abilities that can be used in the battle on the main board. The biggest addition to the game is the new black pyramid color with corresponding power tiles. With three tiles comes new creatures. Also very cool are the new battle cards, now players start with 8 battle cards to choose from. Lastly a new win condition can be used as described in the rule book. Conclusion; this expansion adds a ton of stuff and fixes the turn-order selection from the base game. Adding the modules freely to the base game makes it very diverse and flexible. 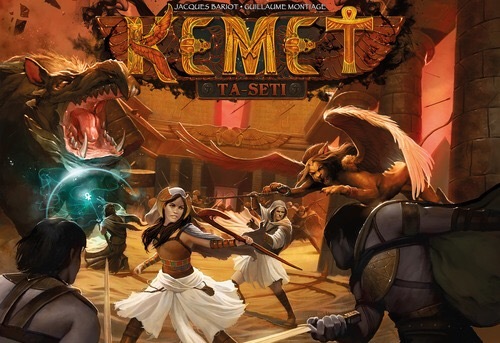 If you like Kemet this looks like a must buy.